Indian writing in English has a plethora of writers attempting the genre of romance or love stories. Such being the case, it takes something extra to stand out from the crowd. By adding a bit of family drama and mystery to the plot, Anurag Anand kind of accomplishes that. 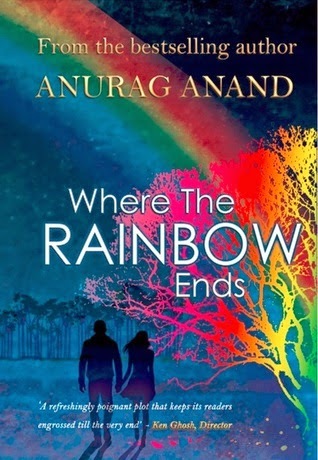 Where the Rainbow Ends is the story of Rahul. He falls in love with Shalini and marries her, and lands himself a good job thanks to his rich father-in-law. The marriage doesn’t work out because of lapses on her part, and even the birth of their daughter Myra doesn’t help the cause. Rahul successfully gets custody of his daughter but that has its own consequences. Then Avantika lands into the father-daughter duo’s life, like a rainbow after the storm. When things seem to be looking up, Avantika vanishes, and another tough phase begins for the duo. In its bare structure, the novel is a love story, be it Rahul and Shalini, or Rahul and Avantika. But the twists thrown in to both these sub-stories hit quite hard and leave the reader thinking. Rahul is the centre of the story, but it is Avantika’s character that the reader falls in love with, and Myra’s character that the heart often goes out to. The novel essentially exudes hope, even when the character has his back against the wall. A story written in a simple yet touching fashion. Though the author’s language is mostly lucid, the starting part actually feels confusing. It brings a smile, yes, but it is confusing. The story for the most part was predictable. And I am not a big fan of the way it ended either. All wrapped up neatly in a bow with the epilogue. The story as a whole lacked something, though I cannot quite put my finger on one particular thing and say that that was it. I wouldn’t say it is the best book that is there, but it has enough in it to stand out of the romance crowd. A breezy read, I think it is best for a journey. It is love story with elements of a mystery thriller that will keep you turning the pages to find out what happens next. Realistic characters brought to life in a simple style. The story overall lacks something. The plotline is predictable, and I’m not a big fan of the ending. 2) Indian Quills 2014 at Tales Pensieve. Reviewed by Leo, for Srishti.